The All New IVECO 22/23 Seater Bus Setting New Standards In Comfort. PHVC are proud to be the only company to offer the factory built IVECO in the UK. We offer unbeatable deals for this versatile and popular mini coach. The front of the vehicle is composed of several different modules. The headlights are located in a high position, and are slightly set back, in order to prevent damage from small knocks and bumps. The strip which extends across all four sides of the vehicle protects the bodywork and provides a visual separation of the lower part, which is home to the mechanics of the bus, and the upper part, which is dedicated to the cab. The large area of glass renders the interior compartment lighter, and allows for increased vertical visibility. The new design also improves the aerodynamics of the vehicle. The Daily Minicoach applies its business instinct to advanced engine and transmission technologies in order to deliver the top class performance you need to complete your mission efficiently and reliably. The widest engine line-up delivers more power and torque, while reducing the impact on the environment with its low emissions. The new Hi-Matic automatic gearbox is designed to ensure maximum performance, minimal running costs, unbeatable comfort and superior gear changes, along with reduced fuel consumption. Thanks to its 8 gear ratios. The Daily Tourys is synonymous with comfort and style for tourist buses, in a compact model. New high-level standard features such as LED lights and individual air conditioning vents can be complemented with a series of even more exclusive options. The new Iveco Multi-media system makes travelling even more comfortable and enjoyable for both the driver – thanks to the sat-nav built into the dashboard and the reversing camera – and for passengers, who can make use of an LCD monitor. Among the other equipment available are the USB ports in every seat, the drinks fridge and the coffee machine beside the driver: the perfect companions for long journeys. Iveco Bus offers a wide range of new and remanufactured replacement parts, maintenance kits and service packs to keep maintenance costs down and limit environmental impact. Iveco Bus knows that time is important for its customers. This is why we rely on an advanced and highly efficient system of Parts provision and distribution for delivery both day and night within 24 hours from order in any Country, 7 days a week. IVECO BUS offers an extensive support network for its entire vehicle range guaranteeing customers the best assistance through continuously trained and skilled technicians. 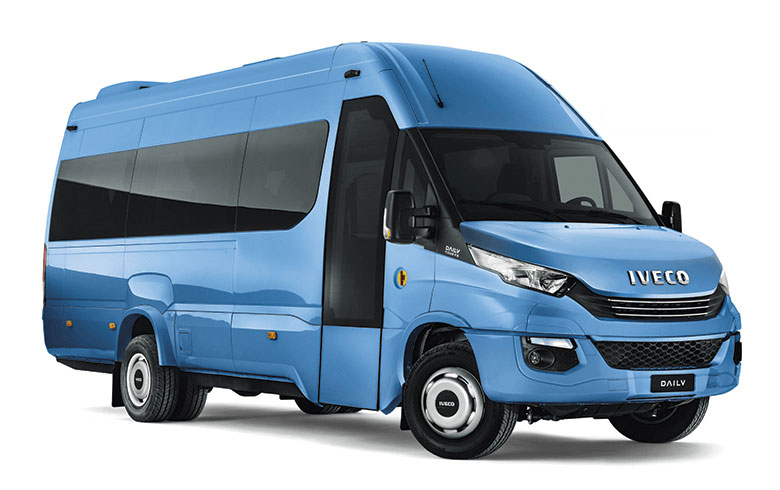 The Daily Minicoach truly is the minicoach par excellence: a vehicle which provides exceptional road holding and incredibly easy, comfortable handling.